Welcome to Wharf Aquatics Tropical Fish Department. 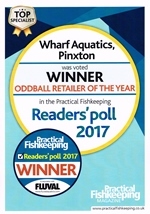 Voted Tropical Freshwater Retailer of the Year no less than six times in eight years by the readers of Practical Fishkeeping magazine, our multi-award winning Tropical Freshwater section houses over 500 tanks containing a wide variety of fish, from popular community fish to very rare and unusual species. We always have a wide range of popular community fish for sale including many tetras, barbs, danios, gouramies, rainbow fish, guppies, platies, mollies, catfish and loaches. We stock a wide range of cichlids including almost 100 tanks of African Rift Lake cichlids from Malawi and Tanganyika in a separate dedicated room. We also stock cichlids from central and western Africa, the Lake Victoria basin and South and Central American cichlids – including many rarely imported and hard-to-find species. 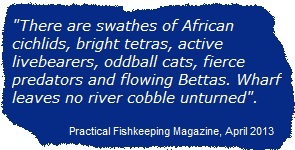 Catfish are also a speciality, with many rarer types often in stock. We always have a range of “L-number” plecs and Corydoras catfish in stock. We have established particular recognition for our stock of rare and unusual “oddball” fish, and there is always a good selection of these on offer for the fishkeeper that enjoys something a little different! 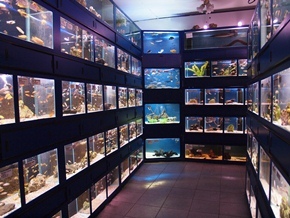 Please see our Stock section for up to date information on our fish. Most importantly, we have the experience to give the right advice on keeping fish with more specialist requirements, as several of our staff members have many years of first-hand experience keeping these fish at home. 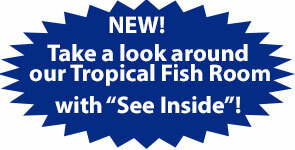 We have new deliveries of tropical fish every week from UK wholesalers and our own direct imports. We also stock good quality fish from UK hobbyist breeders. A main attraction in our Tropical Freshwater room for many years was our huge 1,500 gallon (6,800 litres) display tank, which measured 8 feet long by 6 feet wide and 5 feet high (244 x 183 x 153cm). However, after more than 20 years, it was in need of replacement, so we are in the final stages of installing two brand new large tanks in its place.